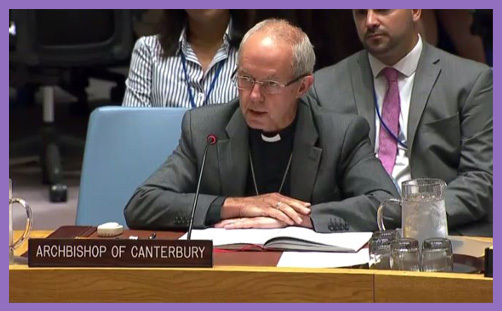 Yesterday, Justin Welby became the first Archbishop of Canterbury to address the UN Security Council. His subject was mediation and conflict resolution (he sits on the UN Secretary-General’s advisory board on mediation), and he spoke with manifest authority from his considerable experience (which, you may recall, once took him to Nigeria and Burundi where he phoned his wife, Caroline, to say goodbye as he stared down the barrel of an AK-47). He has a manifest passion for peace and reconciliation, not least because the average Anglican “is a poor woman living in a conflict or post-conflict setting”, and ‘blessed are the peacemakers‘. …The role that an institution like the church plays here is significant. Religious institutions are often the only functioning institution in a fragile or pre-conflict situation. They are present before, during and after conflict. They provide early warning for signs of conflict in communities. Working with and through religious and other institutions to provide ‘pre-emptive’ reconciliation frameworks can stop conflict becoming violent or returning to violence – it can set it on a different path. Their work is done by young and old, by women and men, by rich and poor. It seeks a peoples’ peace. …Earlier this year, I hosted an ‘Emerging Peacemakers Forum’ in London – bringing together 50 young Christians and Muslims from around the world in pre-emptive reconciliation to learn about leadership in peace-building. My colleagues’ superb work liberated participants to inspiring visions of peace. They will serve peace for many years. Pre-emptive reconciliation is about fostering relationship or forging bonds of fraternity, which is increasingly difficult in an age of individualism where an Englishman’s home is his iPhone. The postmodern field of civil society is lived out more on Facebook than it is in the congregations of market, arts or religion. When one’s community is composed of cyber-‘friends’ and ‘followers’, and one’s self-belief is contingent on ‘likes’ and ‘RTs’, how does the Church speak peace into a virtual echo chamber which thrives on grievance magnification, belligerence and hostility (which means more ‘RTs’ and so more ‘followers’, because everybody likes a good scrap)? What does pre-emptive reconciliation mean in a context of endemic debt, depression, drugs, alcoholism, crime, and family breakdown? It is, of course, laudable to host an ‘Emerging Peacemakers Forum’ in London – “bringing together 50 young Christians and Muslims from around the world in pre-emptive reconciliation to learn about leadership in peace-building”, but what about those nearer to home who were not chosen to participate? Who will talk to them about pre-emptive reconciliation? How will they learn how to thrive when their bellies are empty, their fathers beat them, their mothers abandon them, and in their loneliness and despair they inject heaven into a vein, and see that it is good? Where is the pre-emptive reconciliation in a culture of perpetual alienation wrapped in concentric circles of self-loathing, indignity and boredom? Isn’t it just friendship? Isn’t it about listening? Isn’t it about sharing a meal together? Isn’t it just getting alongside someone to make them feel safe and valued? Why coin a brave new term to describe ‘love’? Pre-emptive reconciliation may form a great theoretical framework for the UN Security Council, but when the manager of Liverpool FC talks about the need to get your retaliation in first, the players look at each other, roll their eyes, and think ‘attack’. Keep it simple: pre-emptive reconciliation is the spirit of unofficial cooperation. It is the spontaneous game of football between Tommy and the Hun; it’s an orchestra made up of Palestinian strings and Israeli woodwind; an Olympiad of North and South Korea walking side-by-side under one flag. It doesn’t need to be a UN ‘framework’, because the need for society is a natural impulse. Far better to work with individuals and families, and from there to work with communities and nations, than to be subject to a global formulation of some high-and-mighty collective UN framework. The overarching canopy – if one were needed – is liberty, which is concerned with individual responsibility. There are risks to this, of course, for the more man is free, the greater the inclination to choose the wrong path. But the task then is not to cram the vessel with UN conceptions of virtue, but to point their eyes to the light in the hope (and prayer) that they might see for themselves ‘whatsoever things are honest, whatsoever things are just, whatsoever things are pure, whatsoever things are lovely, whatsoever things are of good report‘. In a nutshell, the world needs more pubs, more football, more Proms and more cups of tea. Doesn’t that sound better than ‘pre-emptive reconciliation’?